1% in January 2018, with an extra 1% in August 2018 if the state meets revenue targets of $27 billion. We are working with a coalition of unions, including UMass Amherst, Dartmouth, Lowell, and state employees with SEIU and NAGE (National Association of Government Workers) to increase this offer. ► Parking- The Administration wants to negotiate parking fee increases. We have yet to receive their offer. ► Research Intensive Semester for Junior Faculty- We reiterated to the Administration the importance to our junior faculty of this issue. We are awaiting a response. 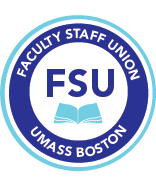 ►Tuition Waiver Benefit-We submitted a more generous proposal along with other UMass university unions. The Administration will review and respond. ►Non-Tenure Track Faculty – We have exchanged proposals on a few details clarifying the nature of the service NTT will be performing (see previous update for details on the NTT service agreement we reached). We expect to reach agreement on the totality of Article 21 (NTT) shortly. ►Clinical Nursing Faculty – We have met a few times since the last update and exchanged proposals clarifying the promotional process, workload, and job description. We are close to agreement on most issues but remain stuck on the question of workload (the FSU is proposing a 3/3 workload plus service and/or scholarship, which reflects the current job requirements; the Administration is proposing 4/4 inclusive of service with scholarship optional). We are hoping this fundamental disagreement on workload can be addressed but will update you on steps that we- and you- can take to create movement on this. ►Distance Learning- The Administration has proposed language that would modify the distance learning agreement (Article 35) in a few significant ways: 1) it would eliminate reference to CAPS which would allow distance learning courses to be offered directly by departments, 2) it has proposed language that allows departments to pay an individual or individuals to develop certain courses without having to grant them intellectual property rights (these would be ‘basic’ courses that would be designed for any members of the department to use). The FSU is planning to counter with language that: A) would require distance learning courses to follow the overall NTT seniority provision in Article 21.3 (i.e. any distance learning course would be treated as a ‘regular’ course in regards to additional work), B) that all current CAPS policies regarding distance learning be written into the contract (i.e. right of first refusal for developers of distance learning courses, royalty fee policies, etc. ), and C) asked the Administration to be more specific on what types of courses would not require granting of intellectual property rights to individuals and the formal mechanism by which that would be determined. ►CAPS/Continuing Education- The Administration proposed that Fall/Spring courses currently offered off-site or after 3PM on Friday regardless of location would become continuing education courses that would be paid at a set rate ($4,900 to TT and NTT with continuing appointments, $4,400 for any NTT without continuing appointments), i.e., not at the individuals rate of salary unless the course in question was part of an NTT’s continuing appointment. They are also proposing these rates for Summer/Winter teaching. And they have proposed eliminating the priority list for Summer/Winter courses, giving full discretion to chairs to assign courses as they see fit. We will be offering a response that includes retaining a Summer/Winter priority assignment system and that proposes somewhat higher Summer/Winter rates. ►Librarians – We reached an agreement on changes to the Annual Report and Evaluation for Librarians, which will now be called the Annual Librarian Report and Evaluation of Professional Activities to align with faculty and Amherst librarians. The report also adds language to clarify professorial activities. We are still negotiating over a stipend for internal appointments to department head and changes to minimum years in service for promotions. We expect to reach agreement with the administration soon. ►Sexual Harassment Policy- The Administration is proposing to modify the current policy to require faculty to be mandatory reporters of sexual assaults per Title IX. They are also proposing modifications to the due process requirements of the sexual harassment procedures. We are establishing a team to work on this and respond.